A gentle handmade soap made with organic honey, unrefined cocoa butter and beeswax. The best soap for smooth, creamy, gentle bubbles. Organic honey, unrefined beeswax handmade artisan soap with natural cocoa butter has the scent of warm, fresh California honey directly from the hive. My best handmade soap is a moisture treat for your skin that contains the nourishing benefits of virgin olive oil, natural coconut, pure cocoa butter, organic honey, unrefined beeswax and castor. This is a smooth, creamy and rich soap for sun parched or winter weary skin with lots of mild creamy bubbles. Each bar has a honeycomb design on top. The honey is harvested from a local bee keeper’s honey hive, so each bar has a natural golden honey color. Each honey soap is cut by hand and weighs about 4.5 ounces. I use the best olive oil for this soap batch, as olive oil is wonderful for your skin. Coconut and palm kernel oils provide mild cleansing properties. Castor oil adds bubbles. Cocoa butter and honey have moisturizing abilities. 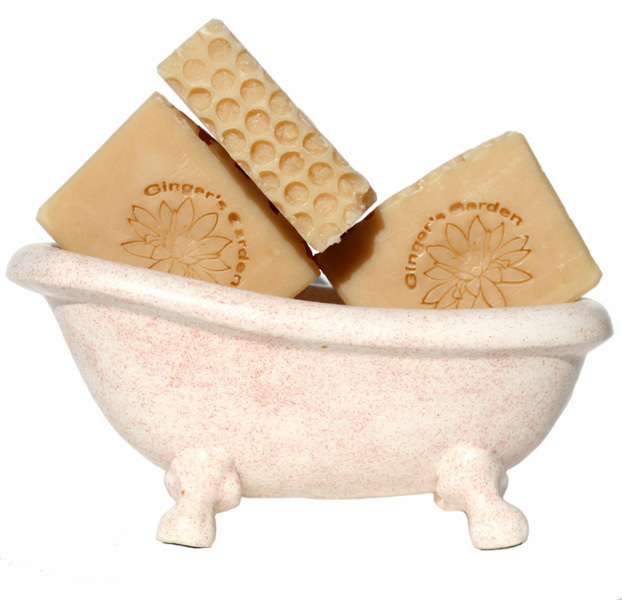 Natural beeswax adds hardness, so the soap lasts longer. Honey also helps increase lather. Organic honey, unrefined beeswax and cocoa butter handmade soap is mild enough to use as a facial or body soap. It is a cold process soap that has been well aged to make it gentle and longer lasting. This method provides the best soaps because any oils or butters do not overheat and help retain their beneficial properties. Natural honey handmade soap benefits all skin types; whether your skin is acne prone, oily, dry or mature. My handmade soap can be used on young children too. Your handcrafted soap will last longer if you keep it out of standing water and use a soap dish that drains. This decadent handcrafted soap is honey in its perfection. Think of this honey soap as a piece of comfort in your bath or shower. Each bar comes in its own recyclable paper soap box. These soap boxes help protect the handmade bars during shipping and are good for the environment. Ginger’s Garden handmade soaps make a wonderful and a unique gift. Treat your skin to be the best with organic honey, natural beeswax and unrefined cocoa butter handmade soap. Ingr: Olive oil, Coconut, Palm Kernel, Cocoa Butter, Castor oil, Soybean, Sodium Hydroxide, Beeswax, Honey, Sodium Lactate, fragrance.